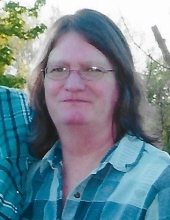 GLOVER, Barbara Ann (Klamert) - Age 61, of Fenton, died Sunday, January 27, 2019. Funeral services will be held 11:00 AM Friday, February 1, 2019 at Sharp Funeral Homes, Fenton Chapel, 1000 Silver Lake Road, Fenton. Visitation will be held at the funeral Home Thursday from 3-8 PM, where a V.F.W. Auxiliary Memorial Service will be held at 7 PM followed by a Fraternal Order of Eagles Memorial Service at 7:30 PM. Those desiring may make contributions to Fenton V.F.W. Curtis Wolverton Post #3243. Barb was born May 14, 1957 in Flint, the daughter of Clarence "Clem" and Donna (Gipson) Klamert. She was a graduate of Fenton High School. She married Robert Carl Glover May 27, 1987 in Fenton and he preceded her in death February 23, 2014. She had resided in Fenton most of her life. Barb worked for the Fenton V.F.W. as a bartender. She was a member and current president of the Fenton V.F.W. Auxiliary Post #3243. She was also a member of the Fenton Fraternal Order of Eagles Aerie #2460, and the Holly Moose Lodge. Surviving are: daughters, Dawn Glover and Shea Glover both of Fenton; granddaughter, Alekzin Glover; siblings, Bonnie (Jack) Pray of Fenton, Beth (Gerald "Hawk") Hawkins of Swartz Creek, Roger (Kathryn) Klamert of Clio, and Rick "Dickie" (Deborah) Klamert of Tennessee; brother-in-law, David Glover of Glennie; and several nieces and nephews. She also preceded in death by her parents. Tributes may be posted at www.sharpfuneralhomes.com. To send flowers or a remembrance gift to the family of Barbara Ann (Klamert) Glover, please visit our Tribute Store. "Email Address" would like to share the life celebration of Barbara Ann (Klamert) Glover. Click on the "link" to go to share a favorite memory or leave a condolence message for the family.